This Mel Bay Gig Saver gives aspiring guitarists ideas about jazz guitar accompaniment in a brief, affordable, yet informative fashion. 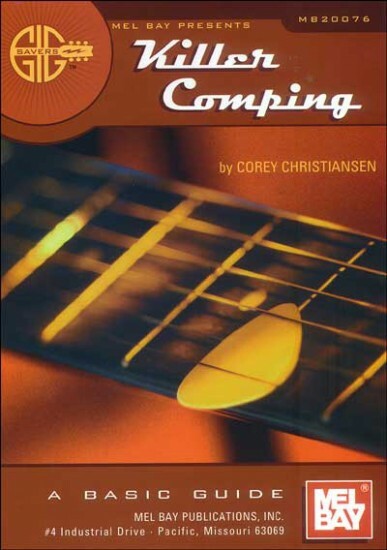 In jazz, the term "comping" means to accompany, and in some cases, to complement. It is the job of the harmonic instrument (guitar) to provide a background for other musicians to improvise against or a singer to sing against. The idea, when comping, is to make the other musicians comfortable while they play and to help their solos feel "complete." This book gives the guitarist a number of chord shapes and rhythms that can be used when comping in the style of Freddie Green, and in bebop and later styles. There are also blues progressions and an etude to practice applying the concepts.